Love cheesy scalloped potatoes? 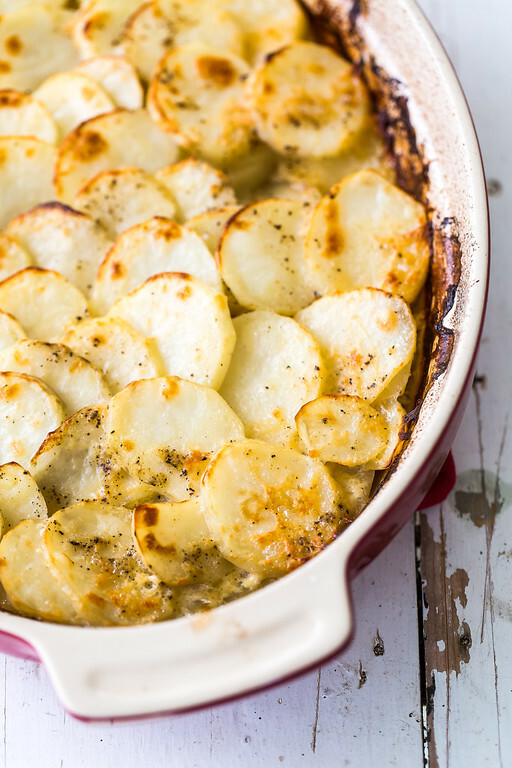 Love easy scalloped potatoes? Then you’re going to love these Smoked Gouda Scalloped Potatoes, so rich and creamy! I personally believe there is no such thing as too much cheese. When I’m at a restaurant and something comes with cheese (think pizza), I always order extra cheese. Cheese makes everything better. More cheese makes everything more better. Especially potatoes. Cheese and potatoes are a match made in heaven. Like this Smoked Gouda Scalloped Potatoes. 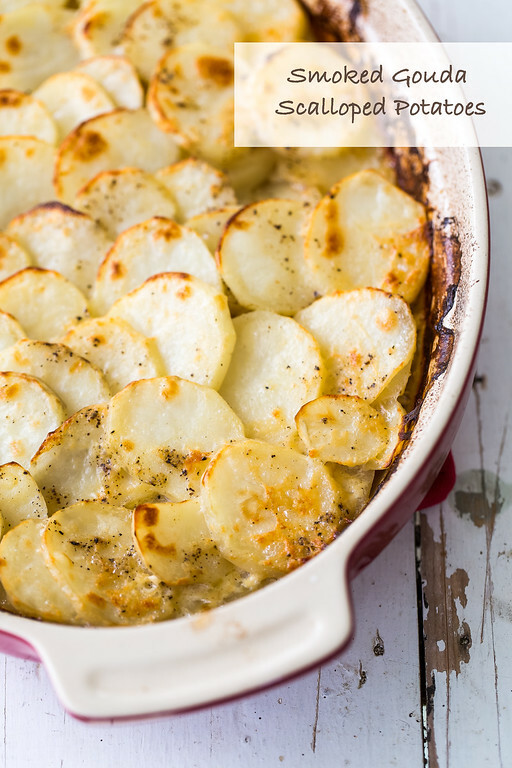 Click here to pin these Smoked Gouda Scalloped Potatoes now! However, I know not everyone shares my love of excess cheese. My tight jeans particularly do not like my love of cheese. Mr. Sidewalk Shoes only shakes his head as he watches me eat my pepperoni with extra cheese pizza slice. So, when I knew I was going to make some scalloped potatoes to go with our ham, I knew there would be cheese. But how much cheese? Since the hubs and I agree to disagree on the appropriate amount of cheese, I needed something that would satisfy me and him. Enter Smoked Gouda. You want to get all that cheesy flavor without all that cheese, use smoked cheese! You don’t need as much it makes all parties involved happy. You will love how even a smaller amount of this smoked gouda makes these Smoked Gouda Scalloped Potatoes taste so cheesy! So, go ahead. Make some happy potatoes. For best results you need to slice the potatoes thinly, I use a Benriner Mandoline. 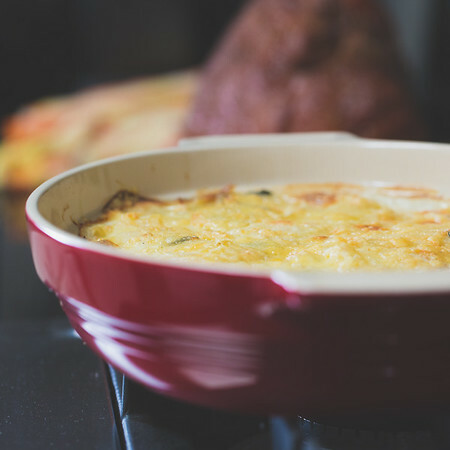 You also want to use a shallow casserole dish or a gratin dish so you have lots of potatoes getting brown on the top, like this La Crueset Gratin and this All Clad Stainless Steel Version. These Smoked Gouda Scalloped Potatoes are so rich and creamy, you won't realize they use less cheese! Rub the inside of a casserole baking dish with garlic. Spray with cooking spray. Layer half the potatoes in the dish. Pour over two tablespoons of the melted butter. Sprinkle with salt and pepper and then 1/2 cup of the smoked gouda. Repeat for second half of potatoes. Pour milk over potatoes. Cover tightly with aluminum foil and bake for 1 and 1/2 hours. Uncover and bake for 15 more minutes to brown. These are absolutely delicious!! They were an excellent side dish for hobo dinners with too much left over potato from the foil packs! We made a mini batch which was able to bake in the same amount of time as the foil packs! These sound heavenly! Anything with smoked gouda is my FAVORITE! Nothing beats potatoes and cheese! These sound so good! We’re all cheese fans in our house, and I have a soft spot for smoked gouda as well so sure these would go down well here! You had me at cheese. I’m in the cheese camp. And the potato camp. Cheese and potatoes together are a match made in…. Well, you know. My daughter refers to her fiance as a “cheese snob.” He loves cheese of all kinds, a love he learned from his father. They are both engineers, which proves that a love of cheese is a scientific necessity, right? And how could Mr. SS not be on board with more cheese equals more better? Here and I’d grown to believe he was a most sensible man. Still, I’ll bet he loved these potatoes, loaded with cheesy goodness. I have to agree with you, Pam, there is no such thing as too much cheese! I have tried smoked ricotta and smoked mozzarella, but have never had any smoked gouda – these potatoes look so delicious! Smoked gouda is one of my favorites. And I am firmly in the MORE CHEESE camp! These look FREAKING amazing and I can’t wait to try them. I LOVE SMOKED GOUDA! Thanks for posting this!